No matter what type of home you live in, the kitchen is most often where family and friends like to congregate. Enjoying a home-cooked meal, a glass of wine around snacks, or baking holiday cookies, the kitchen is where the heart of the home is – and this has been true for centuries in many cultures around the globe. One of the most important qualities of a kitchen is the cabinetry – it keeps things organized, maintains a clutter-free environment, and promotes a sleek design that carries through the entire home.Over the decades, there have been many advancements in kitchen design, particularly in cabinetry options. Today, there are certainly very specific trends that are popular amongst remodeling homeowners and those who want to update their kitchen. If you’re struggling to come up with a fresh, sleek design for your kitchen, look no further; in this blog, we’ll go over some of the current and popular trends in kitchen cabinetry. Utilizing a mixture of closed cabinetry with exposed shelving is a great way to open up your kitchen space. Having completely open shelving can be overwhelming to the eye, so it’s important to selectively decide where exposed shelving should go. This is a great way to display some unique design elements or keepsakes in your kitchen. At one time, ornate kitchen designs were the way to go; they implied a rich quality and aesthetic to the space that meant high-end, luxury. However, current kitchen design trends are becoming less ornate and more simplified. Clean lines in kitchen cabinetry is a great way to update an outdated look and modernize your kitchen area. Simpler-looking cabinetry gives more opportunity to provide other eye-catching pieces, such as stunning countertops or fixtures. Cabinets play an important function in modern kitchens – they keep all the clutter off of the countertops, they keep food organized and properly rotated, ultimately allowing for a calming and efficient space. Today, kitchen remodeling experts have found even more impressive ways to organize the contents of our kitchen cabinets, such that things are easier to reach, easier to find, and overall more accessible. 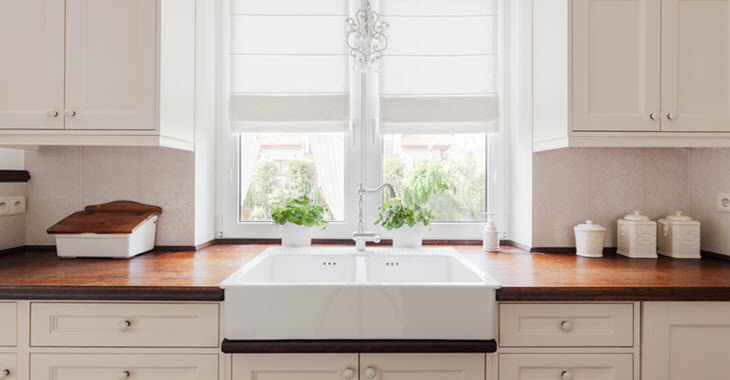 It’s important for your kitchen design to be pleasing to the eye on the outside as well as on the inside – otherwise it could turn into the metaphorical closet you throw all your dirty clothes in when company comes to visit! Is the cost of the changes going to benefit the overall value of your home someday? This is especially important to consider if you think you may sell your home in the future. It is often the case that the kitchen is what inspires the design of the rest of our homes; before your kitchen cabinetry changes, think about the existing design of your home and whether this is the beginning or the end of aesthetic changes you’ll be making. Congruent with current trends in kitchen organization and exposed shelving concepts, it’s important to consider how your new design will function for your kitchen needs. Every home and every family is different, so always make choices with function in mind. Finding the right kitchen cabinetry while staying on budget and utilizing current design trends is made easy when consulting with the professionals here at Kitchen Emporium. 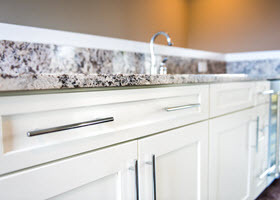 Serving the Southern California areas of San Marcos, San Diego, and the San Fernando Valley, it is critical that our kitchen cabinetry options are vast and on-trend. To schedule a consultation with one of our design experts, please contact us directly. We look forward to helping you achieve your dream kitchen!